Place of Origin: Africa, Togo, Benin, and Nigeria. Typical Tank setup: Well planted aquarium with a lot of hiding places, the more densely planted the better. 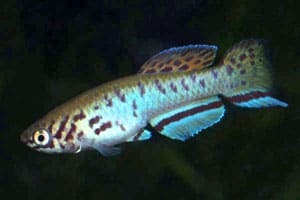 Good for a planted aquarium due to peaceful temperament. 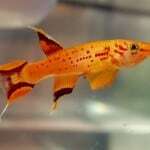 Compatibility: Perfect for the community fish tank although species only nano aquarium would be good. 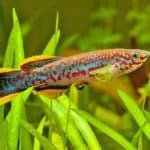 Feeding: Killifish will accept most live foods such as brine shrimp, white worms, tubifex, and some dry flake and frozen foods. 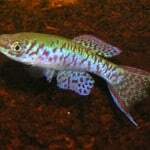 Sexing: The males of this species are more brightly coloured than the females. Breeding: They lay a few eggs each day during the breeding period. They then rest for a while before entering a new breeding cycle. Coconut fibre makes for good breeding substrate. The eggs should be in semi-dry incubation for 6 -10 weeks before hatching. 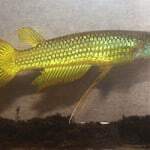 The fry grows very fast and is recommended to feed them on brine shrimp. 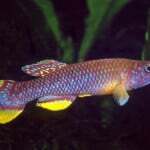 Additional Information: Excellent fish where the focus of the aquarium may be plants due to their peaceful nature and interesting behaviour. 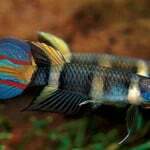 This entry was posted in Profiles Tropical All Fish, Profiles Tropical Killifish. The fish in the middle of a school control the school. The fish on the outside are guided by those in the middle. 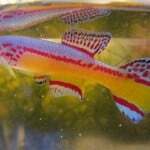 Only bony fish can swim in highly coordinated groups. 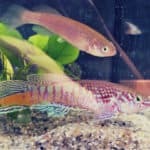 What type of fish do you keep?